So we keep coming up on these myths – wive’s tales – urban legends of “if you do this” then “they will do that” for various things at Walt Disney World. Well we have decided to test them out, see which ones are true, which ones are false. I am sure there are many more than what we have listed below, and if you would like us to test one out, then please leave a comment below telling us the myth, and we will test it. Yes the “What happens when you Yell “Andy’s Coming”?” Myth is below as well. 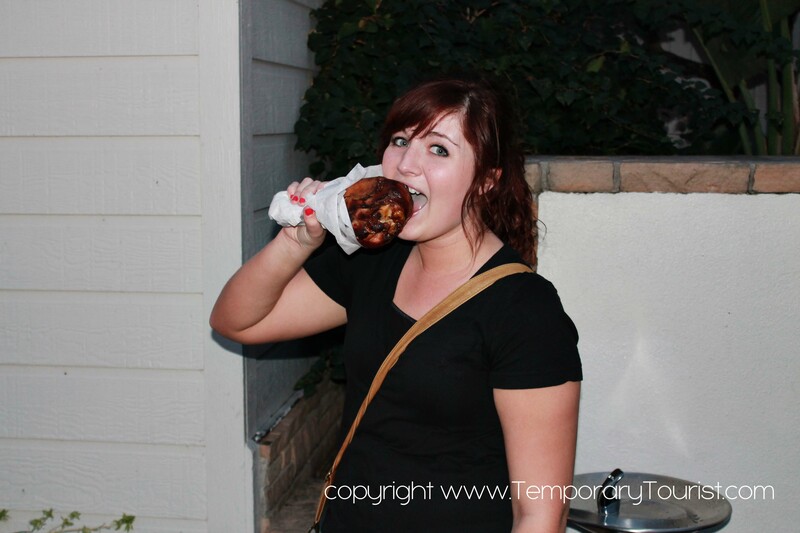 Myth: That if you Gobble like a turkey they will give you a free turkey leg. Fact: You can’t just walk up and ask, rather they have to select you, and they select one person per hour. If you are lucky, and happen to mention it, then someone in your party maybe selected if a turkey leg hasn’t all ready been given out that hour. YES – This one is true. Over Christmas my eldest daughter and her boyfriend came down from CO to visit for a few days, and she actually gobbled for a Turkey Leg! The Video didn’t turn out very well, but here she is with her turkey leg. What happens when you Yell “Andy’s Coming”? 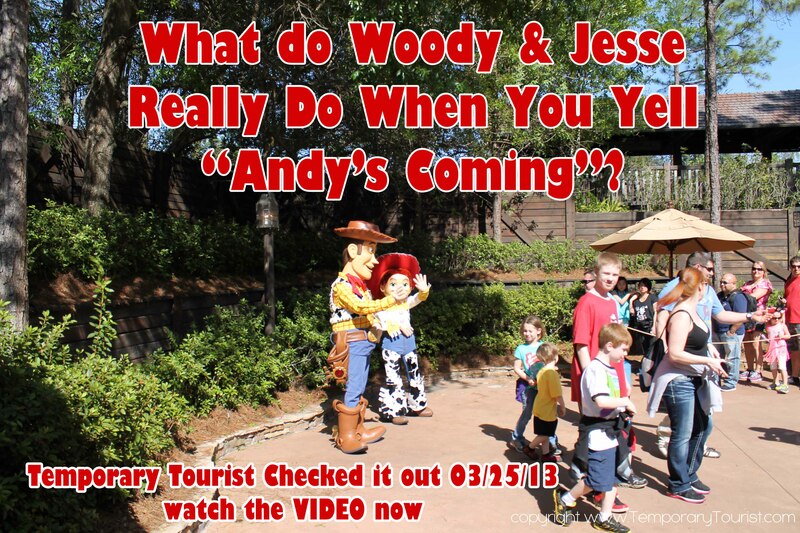 Myth: If you yell Andy’s coming in front of Buzz or Woody they will stop what they’re doing and drop. We have tested this one today 3/25/13 and got video of both our teating the myth and a cast member interview regarding it. We will post the results tonight. 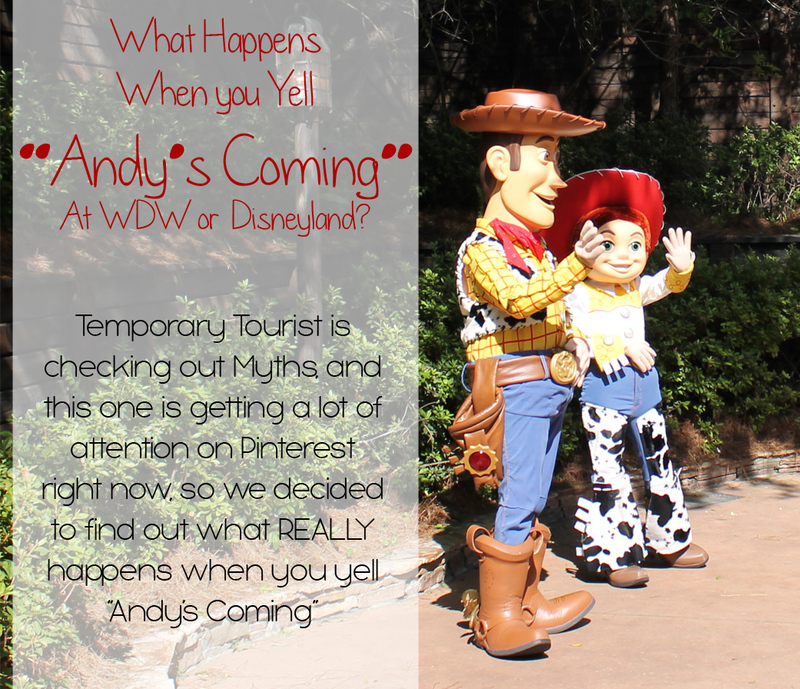 So what happened when we yelled “Andy’s Coming?” – – – – – Nothing, Disney has changed it’s policy and will not allow it. They say it is too dangerous. Watch the video below to see our test and the interview with the cast member about this myth. *many people are not watching the video all the way through and asking questions still. We speak with a Cast Member at 49 seconds in about this myth, and why Disney has stopped this policy. Myth: At The Great Movie Ride, the lions at the front are not really lions. They are dogs! Supposedly, if you can tell the CM which one is the female, they will walk you through the back door, bypassing the line. TT: So Question for you, We’ve heard that the myth of those two statues are actually dogs. CM: They are two dogs. There is a male and a female. The female is that one and the male is this one. TT: We heard a myth that if we were to identify, which you just did for us, (laughing), that if we were to identify which was the female and which one was the male. That we would get escorted to the front of the line. So as you can hear, you have to be chosen for this special experience. Just like the Gobbling for the Turkey Legs. If you get selected, please let us know! Myth: The big points in Buzz are found leaving the first room. Turn around and shoot the back of the Orange robots arm or the back of the buzz saw. 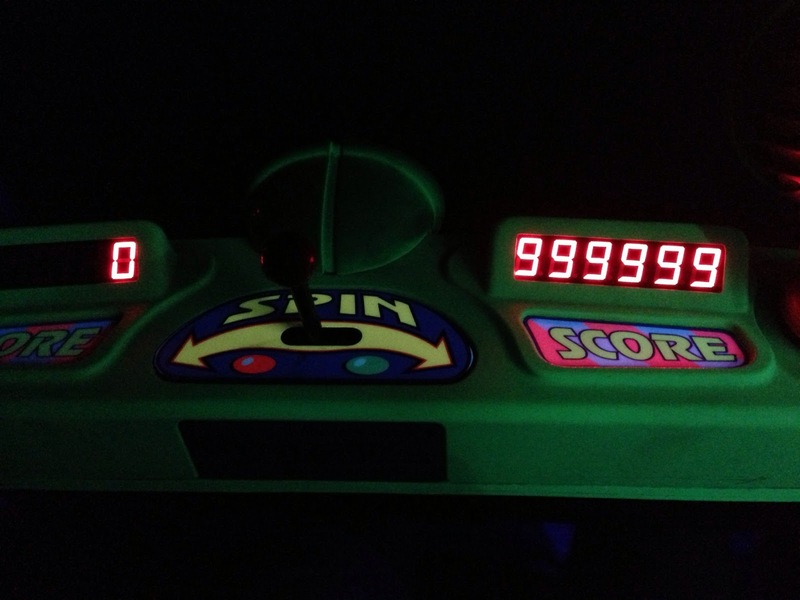 100,000 points. The car turns automatically away form these so turn back score big! Fact: YES do this! Patrick has actually maxed out on the ride because of this little trick. Seriously 999,999!!! 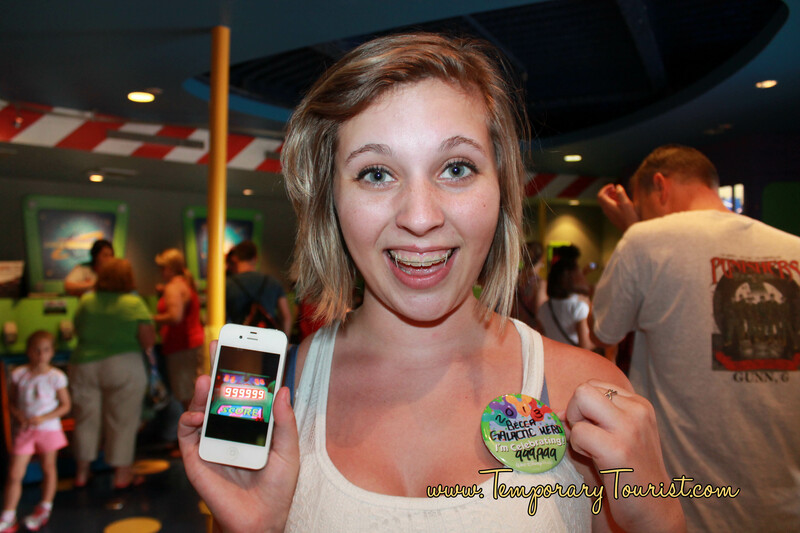 Update: Becca has now also achieved the perfect score on this ride as well! Myth: This one has several different variations, but basically they come down to the same thing, at night, if viewing from the right angle, you can see a lion on the Tower of Terror. We are working on verifying this one still. So far we have yet to see it, but we have a few more attempts in mind. Myth: Have the whole family go into the Barber Shop for a coloring job! Free of charge and painted little Mickey heads on the back of the kids heads. Barber sprinkled ‘Mickey dust’ on all of us. For the second one, those are eastern style lions, you see them often as statues in my county. Fu Dogs are the Chinese version of an Indian mythical lion called “Yaali”. And you can always tell them apart, because the female one has a baby lion under one of her paws. The lady at the back of the turkey leg line looks like she’s about to go postal… it’s just the turkey leg line, after all. I loved your article I never heard about the free turkey leg were gong to try it on our next trip. I have a myth for you. Since they stopped the Sword and the Stone show at Magic Kingdom I heard that they sword is on a timer and it will go up every few pulls. I even heard of it going up with out anyone being there. Sound like a fun one to try. We got to bypass the line at the great movie ride! They said they dont normally do it on busy days but he made an acception for us! We’re trying to gobble next! Awesome! Good luck on the Gobble! My daughter and her cousin got lost from my grandparents coming off of splash island and Disney staff gave them tshirts, beach towels, fans and hats to keep them comfortable til they were picked up! Some of these myths are so amazing! I have heard so many different things over the years, so it is fun to read these! How do you do the Toy Story one? Thank you. Shoot at the hand on the right side…. as you are leaving turn your car around and aim for it…. Yep, I have also heard from multiple guests on the WDWMagic messageboards that this has been discontinued. We used to do this on our trips. If you found one, your group would get a fastpass for Big Thunder Mountain or Splash Mountain. I don’t know if this is considered as a myth but if you see Rapunzel and Flynn, you can ask them if you may see the crown that’s in Flynn’s bag. In the bag, the is also a Rapunzel’s paintbrush. not really a myth but my kid threw his shoe into the waterslide so they gave us a coupon and we ended up with a 30 dollar pair off mickey mouse shoes.. They are all ready public…. thus how we heard of them…. I heard that there was a myth that if you find a paintbrush on tom sawyer’s island and return it to a cast member, you get a fastpass that can be used on any attraction. Have you heard of this myth? I have heard this myth, and we will add it in and test it this week. I can confirm that they did, in fact do this… It was only for the group on the first ferry out to the island. I made sure to get to the park early, and hunted all over the island… There were 5 large, colorful paintbrushes hidden around.. I finally spotted one, and a girl grabbed it before I could get to it. It was upsetting because she already had one, but I didn’t say anything because she was young.. The finders of the paintbrushes (and the members in their party) got fast passes to use at other rides. I had heard if you said “Here Moosey Moosey,” To the Canadian Popcorn cart, you get free beer. We tried it, didn’t get free beer, but the CM had a good laugh, so she gave my hubby free popcorn. Oh My Goodness!!!! That is awesome! I don’t think the lady in gray at the back of the line on the gobble video was feeling the magic. She looked rather aggravated. LOL! I think it’s cute! I had to go back and see that. That’s a shame. It’s all in fun and she’s acting as if she is going to starve to death if she has to wait one more minute. She even cut line up to the window to see why it was taking so long. Way to ruin a good time. She was actually grumbling too, but that didn’t get caught on video…. eh there is always those who are in bad moods at the parks…. and yes sometimes it is even me…. I know! How on earth can you be a party pooper in Disney? It’s the happiest place on earth! Plus, fun things like that are what make the lines managable anyways. My mom, sister, and I went to Disneyland when they visited me here in CA….During our short one day visit: 6 rides broke down while we were in line for them (out of all those we only got to ride 2 in the end), it poured the rain and ponchos were sold out (we found ponchos after it stopped, bought them, and it didn’t rain again), we didn’t get to see any of the characters except for in the parade….We didn’t complain once that day because we were just happy to be there….That lady needs to get over waiting for her turkey leg! The Cinderella Surprise Celebration show isn’t running at Magic Kingdom anymore. It’s been the Dream Along With Mickey show for several years now. BUT… if you stand by the Sleepy Hollow Refreshments restaurant, you can see the backstage area and the characters waiting to go onstage will wave back if you wave at them. Last year my friend and I had some fun interaction with Captain Hook (waving & making faces).